I have recently turned 53 years old and I have incurable metastatic breast cancer spread throughout the liver… at the end I will have such a degree of liver toxicity my brain may well be akin to the confusion and disorientation of Alzheimers, I may well have jaundice and be yellow, my enlarged liver will be crushing my diaphragm impairing breathing and speaking, crushing my right kidney, obstructing parts of my bowel, crushing my stomach and giving me unbearable pressure making it hard to empty my stomach so limiting my food and drink so I’m starving and dehydrating, vomiting blood may be common…. My metastases, if I last long enough for the spread to brain and lungs will ultimately drown me in my own fluids and press and crush parts of my brain as to cause headaches, sensory impairments and significant difficulty functioning… all whilst dealing with dying and imminent death and my friends and husband watching the process…. Let them have their child, sibling, best friend, partner experience the type of death I’m describing and reassess their determination to impose their ideal slow death upon others…. I am lucky…with a failed respiratory drive I can leave my machine off, fall asleep and I will only breathe for a minute or so every 30-90 minutes… I could do this tomorrow, next week, next month…. 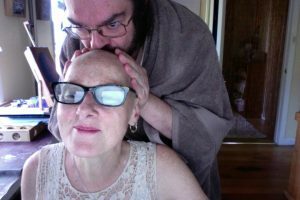 or in my last months or weeks of life… but virtually no patient living with end stage metastatic cancer will have this easy way out… this is our chance to get over ourselves and be humane and value dignity…. If I believed in sky fairies I’d pray that we can escape dogma and in-doctrin-ation enough to put our investments, our fears, our melodramas aside and be this UNSELFISH, this COMPASSIONATE, this SANE. I come from a family with a strong history of cancer. My father died from metastatic bowel cancer before he was 60. On my mother’s side of the family there are so far 5 of us cousins who have lived with cancer, all of them younger than me. One had liver cancer at 9 months old and died aged 4. I will be the next of the 5 to die. In the generation before us four of my mother’s siblings got cancer, some in their 50s, and three died from it, one died with it. Before that generation, both grandparents had cancer several times over, most of their siblings dying from it. Two of these people shot themselves, another finished her life in a hot tub hot enough to cause heart attack. Palliative care has made it easier for the generations that followed, but even in palliative care those with terminal illness who are ready to go may instead be made to wait weeks before their condition finally overwhelms them to the point of death. We would not force an animal to endure that. Early in 2017 our state premier, Daniel Andrews, will strive to get passed through parliament a Dying With Dignity policy along the lines of those countries all around the world currently humane enough and courageous enough to already have one. Under such policies the general current policies basically specify person must be in unendurable discomfort, have less than 6 months to live and this must be verified in writing by two doctors known to the patient. Our local MP for the constituency I live in is James Merlino, MP, has already decided to vote against this policy which would give people like me choice in the last weeks of our lives. Perhaps one day Mr Merlino, his partner, parent, child or closest friend may be in my position and he will watch up close and personal the harrowing consequences of voting against a dignified death. In the meantime I’m sending him a copy of this article in the hope he can consider this is a ‘nothing about us without us’ situation. Thank you very much for showing us and helping us and inspiring us by sharing your story. You are the miracle. You brought us so much hope and courage. I just finished your book and realized you are almost leaving this world, but acutually you leave your amazing spirit on the earth. You taught us so much. You are amazing free spirit!! Your journey continues forever !! I am writing you from Vancouver, Canada. Heartbreaking to find out you are dying; but Sharon, my late wife would love to meet you up in Heaven. Please share with Chris, I will be a friend to Chris, whether facebook or direct email. Life doesn’t end when a spouse dies: I have since met someone new, in love again, and I think heading toward marriage. thanks for your comment John, I have told Chris about you and in time I’m sure he’ll reach out. How long were you on your own after your wife died? I think Chris will take time to come to terms with living alone surrounded by the support of friends and the cats and getting to know himself in this new landscape. When he does one day date it may be this may develop fairly organically out of a familiarity he already has and feels at home with.